This is the summery about tripod buying guide. A tripod is necessary if you want to take steady pictures and videos. Here is a detailed tripod buying guide you can read and decide. Tripod buying is a simple task if you are a professional in choosing the cameras and tripods. However, here you are going to learn how to choose the best tripod for your need whether it is for shooting or photography. You have to consider several facts like height, weight, body, tripod head and stability. How to choose the perfect tripod? Which Tripod Should you Buy? Well. Tripod is a tiny subject, but it has to explore more to know the more about tripods. If you are filming a documentary or short film, then you need a tripod to stabilize the video. In fact, we have the smartphones which support stabilization (ESI) in recording the video, but a tripod is an essential tool to capture the footage with stability. Smartphones with the ESI feature crop the actual video formats original space. That’s the reason why we have to use tripods. Tripods are not expensive, and also you can buy cheap tripods to film your videos. So how to choose the perfect tripod? There are several things you should consider before you decide to purchase the camera stand (tripod). Here are some factors you need to consider before purchasing a tripod and with the experience you can try different tripods as your choice. From a tiny factor to the heavy component you have to consider these things before tripod touching your doorstep. Alright, let’s talk about those factors which are essential for a tripod buying guide. I always recommend buying a tripod which suits your height. That means if you are a shooting a long-term video for documentery or your short films then you have to choose the perfect size according to your need. Moreover, if you’re looking for a tripod which suits for the best photography, then you may compromise, but it should be equal height to your shoulder or above. Minimum height of 4.5 feet is recommended for a good tripod. You have to consider the collapsed height also because when you are travelling, it has to fit in your tripod cover. You have to hold it and can carry everywhere you travel if you are a travel photographer. Always choose the best quality tripod when you are travelling because when you travel around, a cheap quality tripod can easily breakable. Tip: It will be the best if the tripod height is above your eye. You can easily adjust the camera angle. The next factor you should consider before choosing a tripod is weight and construction. Weight is a significant factor when deciding a tripod. The tripod which is not too heavy will be the best choice because you should carry it. Especially when you are a travel photographer or a short filmmaker then you have to carry your tripod all over the places. That’s the reason why you should take care of weight when choosing the tripod. The lightest tripod is made up of ‘carbon and fibre’ material which is durable and stable. The most beautiful thing about this material is that it is non-rustic. However, the tripod with a carbon combination will be high in price. Moreover, the next construction material will be aluminium which is heavier than plastic or Carbon fibre. Most cheap tripods will be made up of this aluminium material, and the guarantee would be in peanut stage. You can also find out some Stainless Steel material tripods, but for the home purpose, they are too heavy. Tip: Try to keep Weight of the tripod legs without the head under 5 pounds. The most important parts in a tripod are tripod legs. Generally, tripod legs are in two forms tubular and non-tubular. Usually, tripods legs have locks according to the length of tripod legs. The more height a tripod has, the less stable it can manage. The legs should be strong, and the joints should be lockable. Most of the tripod have locks to their legs between 3 to 6 sections. As I mentioned above, the more height the tripod has, the less stable you get. If you wish to choose a lengthy tripod then you have to look for material made for the legs and also the number of sections to lock. Custom (which could be anything, including ball-bearings). Most of the advanced tripods allow you to replace the tripod feet for different conditions on situations. For any type of surface, you can easily replace the tripod feet. Most of the people like to experiment with the camera angles and they like to move the tripod on the hard surface and smooth surfaces. For these kinds of situations, you need to replace your tripod feet. The most important and the most essential body part in a tripod is its head. Most tripods come with a head but all tripod heads may not suit you. You can also check this tripod head buying guide for a detail explanation. The head fits on the top of the centre which joints the legs and body height. Head is attached with a cube in the centre which can be raised and lowered with the hand or the tool which tripod has. Generally, this is the heaviest part of the construction, and it has the adjustable locking collar which helps to move the tripod head up and down or side by side. You can also purchase the tripod head separately, but you have to choose wisely because the tripod head should carry the weight of your camera. 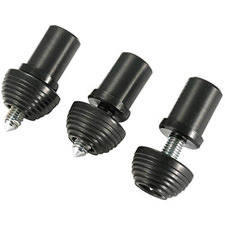 There are three types of tripod heads commonly available, and they are Pan-tilt head, Ball head and Gimble head. Pan-tilt head: Generally this is the most common type of head which is built for the cheap tripod and you can control it with a single hand. The horizontal movement or the vertical movement can be controlled by single or dual handles. Ball head: This type of head has only one control which tightens the group. These are very flexible and allow very smooth operation which tighten the camera. Gimbal Head: This is the specialized header type for long and heavy 300mm+ lenses compared to the pan tilt head and ball head type of tripod head. This handles the camera perfectly, and it balances the footage. They are extremely easy to use in any direction, and you don’t have to operate every time we use the head. Tip: Heavy lenses are the best choice for this type of tripod head for action photography (Gimble Head type). You have to choose the perfect tripod which is stable. Every expensive tripod and a heavy tripod doesn’t make it stable. For various weather conditions and surfaces, you have to utilise the tripod capabilities, and the equipment should fit you. Before trying to buy any tripod, watch some relevant videos or reviews about the particular tripod. The reason why I recommend to choose the moderate tripod or expensive tripod is they come with the guarantee which cheap tripods never promise. Don’t compromise while choosing the best tripod. There are some moderate but yet powerful tripods which will meet your requirements and you can have more stability while capturing the footage. For videos and footage, your tripod should be stable whether you are moving or in hand free mode. Especially when you are taking tilt or pan shots the tripod may not help you when you move your hands roughly in case if the tripod is not stable. Learn to operate your tripod smoothly before taking it to adventure mode. Small negligence can break your entire equipment like the incorrect placement of tripod head or body with the heavy camera and lens fitness. Price is also an essential part when you are thinking about a tripod. These are the primary factors you should consider before buying any tripod whether it is cheap or expensive. So now, let’s talk about what to look for in a tripod? It’s not a big question, but you have to consider it when choosing the best tripod. Here are a few things you might consider, but in case you can leave it exceptional. Head: The first thing you have to look in a tripod before buying is head. The tripod head should be very strong that it can take the weight of any camera or mobile you are going to place. Height: The most important thing when choosing the monopod or tripod is height. The height of a tripod might not depend on the legs. If a tripod comes with the heavy legs, then the tripod can hold the weight of any camera. Always choose the perfect height where you can monitor your footage. Price: Never purchase the cheap tripods which cannot provide the guarantee and which do not have enough strength to hold a camera. Cheaper tripods may have weak legs and insufficient height to adjust your camera angle. Moreover, the biggest disadvantage with the cheap tripods or they come with the weak tripod head. Also, in the result, it may break your tripod parts. So, for your beautiful footage and video you should consider purchasing the moderate or expensive tripods which will work perfectly with the guarantee. Before getting to the point I have something which is related to the tripod buying guide. Whatever the purpose you are looking for, there are some best tripods you can buy now. But as per the requirement and knowledge, every photographer or a documentary maker has different choices when buying the tripod. There are mainly two types of tripods you can purchase and they are, low budget tripod and top of the line tripods. Generally, low budget tripods are different from the cheap tripod. There are some best and good tripods which will suit for any weather conditions and requirement. A big company called Silk Pro has many variants of tripods from low budget to medium budget which can beat any type of requirements. You can check the official website or you can buy them from some limited online stores. Top of the line tripods have separate legs and replaceable heads. That means they are going to expensive naturally because you can change the tripod head and you can replace the tripod legs anywhere and anytime. These type of tripods are recommended for photography and short films/documentary. Buying three cheap tripods in a year is not worthy and purchasing a quality tripod which can resist upto a few years will be the better option. As our team have experience in the tripods and you are not going to recommend you the cheap tripods which can break your video footage and your experience. Always we recommend the best tripods which can meet your requirements and height. A Cheap tripod is always not recommended. Purchase a Quality tripod which can take the 2x weight of your actual camera weight.